Authentic Italian stuffed pasta, perfect for feeding the entire family or for leftovers. 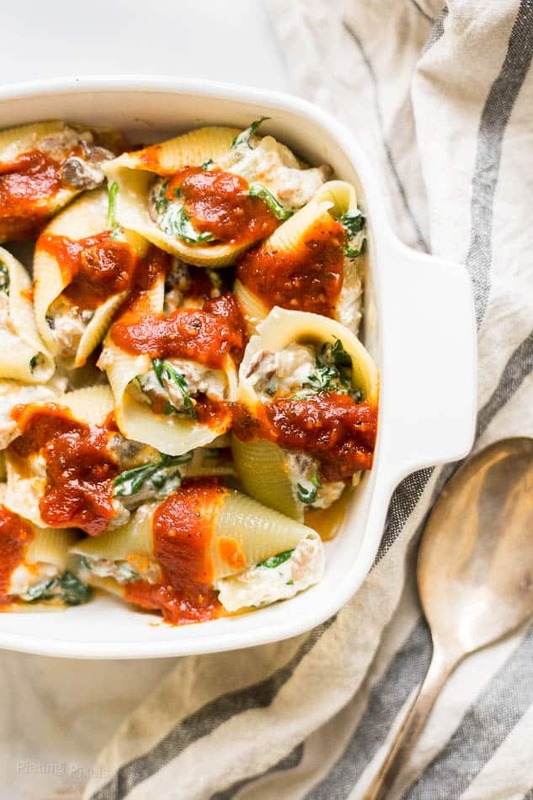 Sausage, mushroom, spinach and ricotta stuffed pasta shells create a unique casserole full of flavor. In this household, we’re all about leftovers. While we like to try new restaurants once or twice a week, every other meal is homemade. To save time and the need to make almost 20 recipes, leftovers are a real life saver. This results in way less meals cooked per week. There’s classic leftover dishes such as spaghetti, soups, stews and casseroles. To keep thing interesting, it’s even better to repurpose leftovers into other meals. 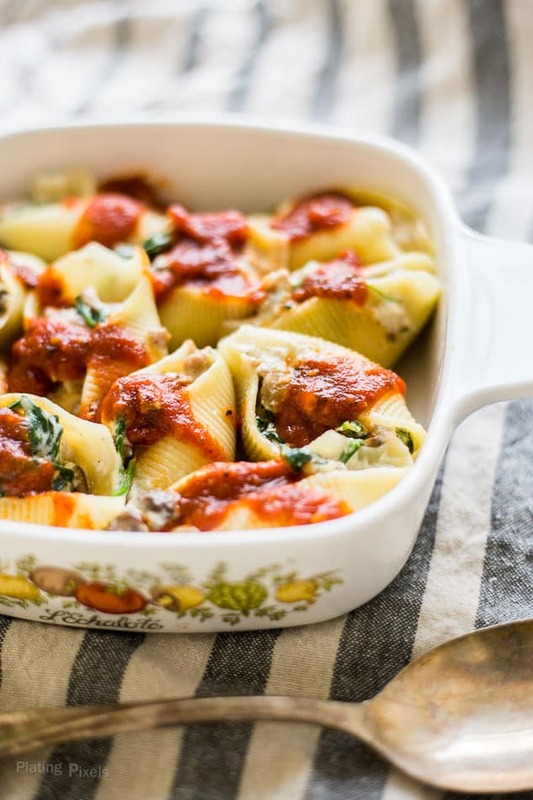 These Sausage, Spinach and Ricotta Stuffed Pasta Shells can be made with your leftover spaghetti sauce. It’s an authentic Italian recipe of jumbo pasta shells stuffed with an Italian sausage, mushroom, spinach and ricotta filling. The texture is thick and creamy and packs rich flavor. Full of veggies and protein, this easy weeknight dinner recipe is perfect for feeding the entire family. For the sauce I used Bertolli® Tomato and Basil. Not just Italian flavor, it’s classic Tuscan with premium, fresh ingredients and handed-down traditions. 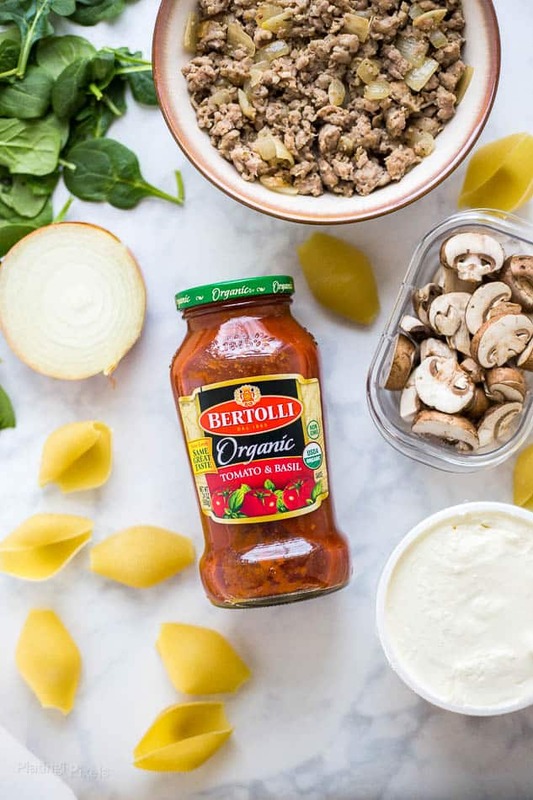 With minimal and natural ingredients like tomatoes, onions, olive oil and herbs, you’ll feel good about sharing this sauce with your family. There’s even organic varieties, which is the preferred choice for most ingredients I cook with. You can find more recipe ideas and tips here. 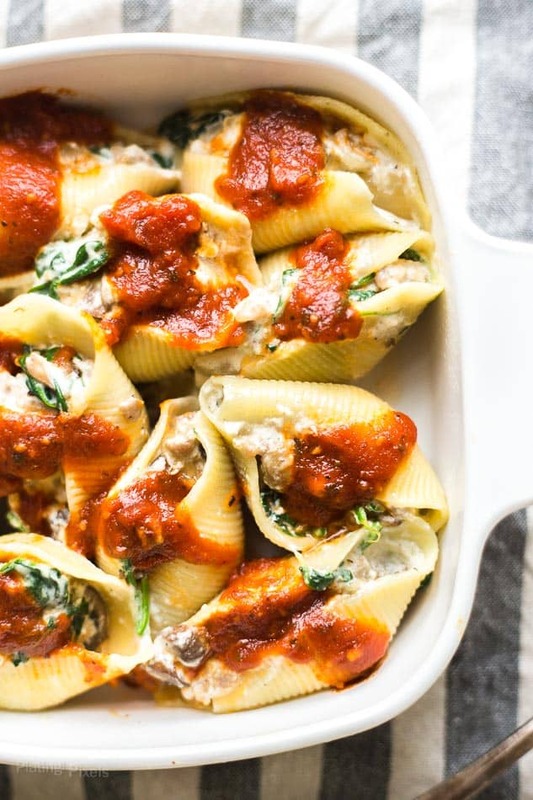 Whether you’re feeding a family, group or just want leftovers, these stuffed pasta shells will be a hit. The recipe can easily be doubled or tripled for easy meals throughout the week. It also freezes well for easy meal prep and batch cooking. Flavor profiles: Rich meaty Italian sausage with creamy ricotta and fresh veggies. Texture: Thick and creamy cheese filling in tender pasta shells. 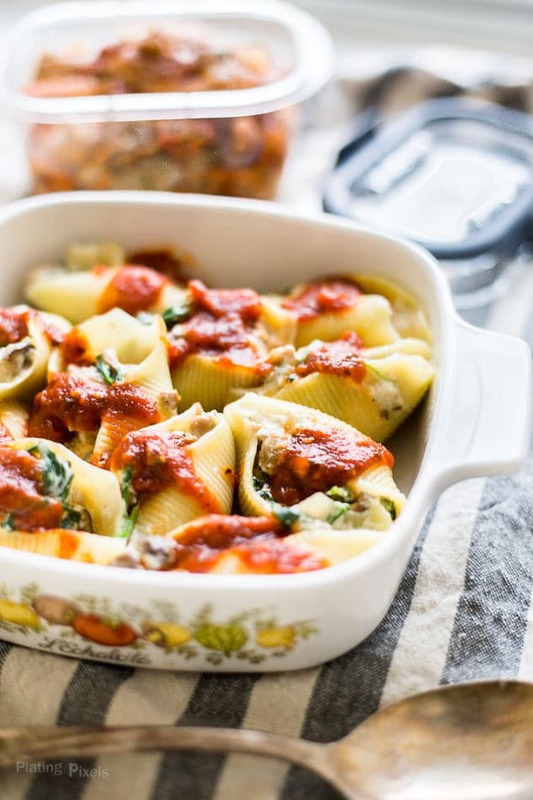 Sausage, mushroom, spinach and ricotta stuffed pasta shells for an easy Italian casserole. Bring a large pot of water to boil, lightly salt if desired. Add pasta shells and cook 12 minutes, or until al dente. Drain and rinse, set aside. Meanwhile: Heat 1-tablespoon olive oil in a pan to medium-high heat. Add onion and cook 4-5 minutes or until fragrant, stirring often. Stir in sausage, salt, pepper, Italian seasoning and garlic. Cook 7-10 minutes until browned, breaking up meat as it cooks. Remove meat mixture and set aside. Cook mushrooms in same pan for 5 minutes, or until any liquid has evaporated. Add spinach and cook until wilted. Chop cooked veggie mixture into small pieces then stir together with meat mixture and ricotta to create filling. Preheat oven to 400° F. Stuff each pasta shell with filling and place (touching) in a greased 8x8 baking dish. Spoon desired amount of pasta sauce over shells and sprinkle with Parmesan. Bake 12-15 minutes, until heated through and cheese is melted. They are pretty amazing. Thanks Kristi! Hi Carlos, thanks for the feedback and you’re welcome!